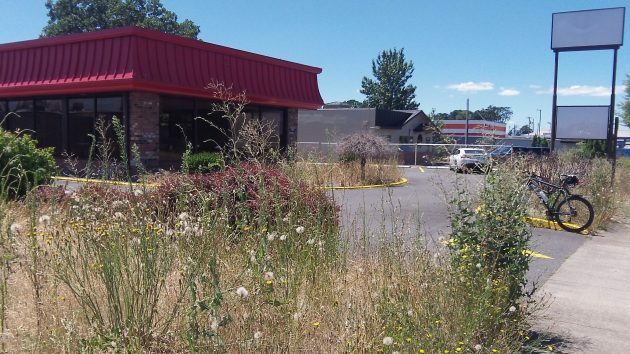 The Wendy’s property on Pacific looked like this last July. Things are happening on the Albany fast-food front. Not only is the Burger King on Geary Street going to be rebuilt, as reported yesterday, but the closed Wendy’s on Pacific will be remodeled as well. The restaurant at 1560 Pacific Blvd. S.E. closed in January 2015 along with several others in the mid-valley. The city summary of the building permit application puts the value of the remodeling at $556,072. Like most projects involving chains or national franchises, it’s a project pretty much of out-of-town interests. The owner of the property is a limited liability corporation in Rancho Santa Fe, just outside San Diego. The permit application was filed by an architecture firm in Portland, and the contractor, Engineered Structures Inc., is based in Boise. We can only hope so. The mayor and the anti-cannabis clones on the City Council seem more enthused about a carousel than about creating favorable conditions for new business opportunity. In the Konopa-Kellum Cabal, a not-for-profit circus in downtown fulfills their fantasy – Albany @ Mayberry. The presence of cannabis retail outlets violates the parameters of the Mayberry illusion. Looking squarely in the rear view mirror, the Konopa-Kellum anti-democratic clique are now sweating freely, fearful that the certain-to-happen No Vote on their beloved ballot measure will cast Mayberry into the depths of the Inferno. Come back, Wendy’s! My kids miss you!